The Rudra Yoga is considered a powerful Raj Yoga (“royal yoga“, “royal union”, also known as Classical Yoga in Astrology). This Raj yoga gives spiritual distinction along with material growth. 1. This yoga occurs with the association of Jupiter and mercury. Mercury should be in conjunction with Jupiter or in aspect by Jupiter. Mercury should be in 1st, 5th, 7th or 9th from Jupiter. 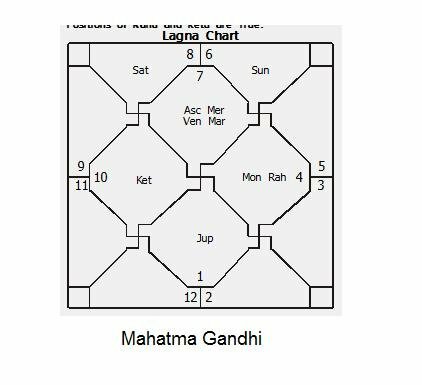 This yoga is evident in Mahatma Gandhi’s horoscope were Mercury is in ascendant and Jupiter is in seventh house. So mercury is in aspect with Jupiter. 2. The house in which owner of the ninth house (Dharma Sthan) is placed; the Navanshesh of that particular house should be either in fourth or fifth house to materialize this Yoga. 3. *If Jupiter is in 12th house. Saturn being owner of 3rd house and placed in 11th house or Sun is in 11th house and Jupiter is owner of the ascendant and placed in 12th house then this Yoga formulates. *This yoga can occur only for Scorpio and Sagittarius ascendant as Saturn can be lord of 3rd house for only these two ascendant. Further condition is given in the yoga is possible for Sagittarius ascendant where Jupiter should be owner of the ascendant. Point 2 is not clear. Can you please give an example.